Artist Summery: Alternative hard rock accented with R&B influences, powerful vocals and soulful harmonies backed by a hard-hitting, heart pounding groove machine of a rhythm section. Style is along the lines of Badlands meets Audioslave. Band Bio: SevenTrain was formed in 2001 in San Diego, CA by guitarist Eric Horton who had previous worldwide success with his former power metal band Cage. As the main songwriter in Cage, his exceptional guitar techniques and songwriting can be heard on such albums as “Unveiled” which was released in 1998 on Omega Records and “Astrology” released on the WWIII label in 2002. 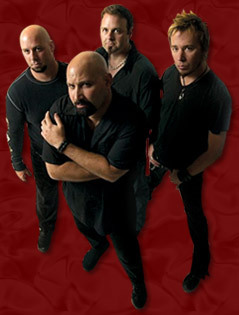 Massacre Records re-distributed both albums in early 2003. During the winter of 2002, the band contacted former 24-7 Spyz drummer Joel Maitoza to see if he would be interested in producing and playing drums on their debut album. Joel’s 30 years of experience in the music industry includes drum performances on 16 major and independent label releases in addition to numerous world tours, videos airing on MTV and Much Music and critically acclaimed reviews worldwide featured in such major publications as Rolling Stone, Spin, Cream, Pollstar and Modern Drummer. After a couple months of pre-production, they went into DML Studios (Blink 182, New Found Glory, Finch) to start tracking their album. The end result is a monstrous hard-hitting 12 song full-length album, which they hope to have released in 2003. Eric's Bio: Eric’s touring credentials with Cage included performances at the Dynamo Festival in Holland as well as the Powermad Festival which also led to opening and co-headline with some of the world’s biggest metal acts such as Judas Priest, System Of A Down, Iron Maiden, Metallica, Queensryche, Static X, Meshuggah, Dio, Dokken, Ratt, LA Guns, Great White, Black Label Society, Exodus and Monster Magnet just to name a few. These professional collaborations provided the knowledge Eric needed to excel within the music industry as well as obtain touring experience. Due to creative and musical differences, Eric made the decision to leave Cage in August of 2000 to pursue a solo career. After recruiting bass player Mike Santangalo and vocalist Shawn Salerno, this led to the creation of SevenTrain. Kurt's Bio: Kurt was contacted by the band in early 2003, when producer Joel Maitoza had to step down from the drumming roll due to scheduling conflicts. Kurt had know and worked with Eric in the past and the two had always talked of working together. He is also the drummer for Southern California based band Festerbilt who released their debut album Supernatural Gangstar in 2002 under independent label Lucky Bastart Records. SevenTrain is currently seeking a licensing/recording contract in order to distribute the new CD as well as reach consumers on a worldwide level beyond their limits of independent self-promotion.